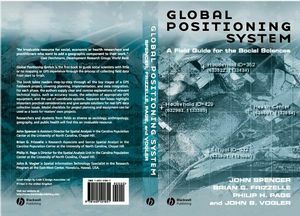 Global Positioning System is the first book to guide social scientists with little or no mapping or GPS experience through the process of collecting field data from start to finish. Takes readers step-by-step through the key stages of a GPS fieldwork project. Explains complex background topics in clear, easy-to-understand language. Provides simple guidelines for GPS equipment selection. Provides practical solutions for real GPS data collection issues. Offers a concise guide to using GPS-collected data within geographic information systems. John Spencer is Assistant Director for Spatial Analysis in the Carolina Population Center at the University of North Carolina, Chapel Hill. Brian G. Frizzelle is Research Associate and Senior Spatial Analyst in the Carolina Population Center at the University of North Carolina, Chapel Hill. John B. Vogler is Spatial Information Technology Specialist in the Research Program at the East-West Center, Hawaii, USA. Philip H. Page is Director for the Spatial Analysis Unit in the Carolina Population Center at the University of North Carolina, Chapel Hill. 4. Coordinate Systems And Datums. 5. GPS Considerations: Getting Started. 6. Developing A GPS Project. 8. Fieldwork Planning And Preparations: Data And Methods. 9. Fieldwork Planning And Preparations: Field Resources. 10. Fieldwork Planning And Preparations: Data Quality And Logistics. 13. Utilizing GPS Data Within Geographic Information Systems. Appendix B: Sample Field Instrument.